On New Year’s Eve 2015, a group of terrorists from Pakistan infiltrated into Punjab, India. Their aim – to attack the frontline Pathankot Airbase, destroy defence assets and kill as many Indian citizens as possible. Following a police report, Indian Intelligence agencies intercept calls made by the terrorists and take measures to pre-empt an attack. The sprawling 2,000-acre Indian Air Force station at Pathankot goes on a red alert. After lying hidden for almost 24 hours, the terrorists are spotted. The hunt begins. 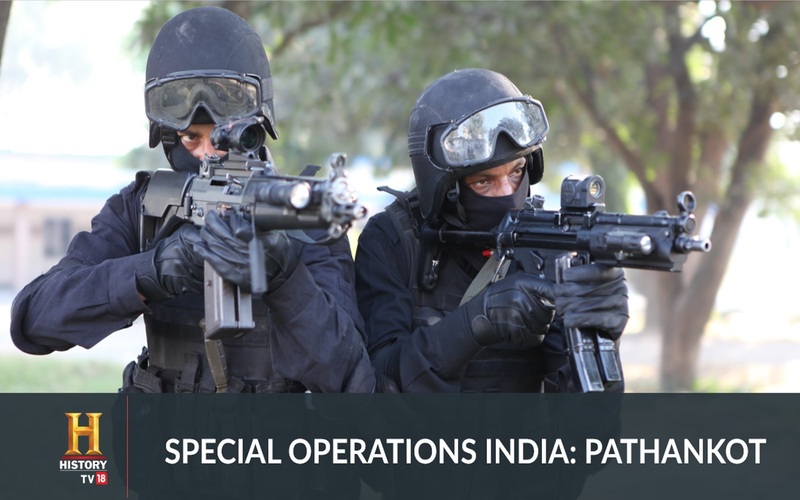 History TV18 presents the true story of the Counter Terror Operation as it unfolded, with “Special Operations India: Pathankot” on Monday, 25th June 2018. This one hour documentary based on true events, is the third film in the “Special Operations India” limited series. The first two, were the path-breaking features about India’s Surgical Strikes in Pakistan Occupied Kashmir and the Indian Special Forces action on insurgent camps in Myanmar. At Pathankot, the Garud Commando Force - the IAF’s first line of defence - along with the National Security Guard (NSG) - India’s elite federal contingency force - were called upon to neutralize the terrorist threat, in a counter terror operation on home soil. The documentary recreates the mission - to hunt down and eliminate the Fidayeen terrorists - in dramatic action sequences, with authenticity and little known facts. Indian Special Forces successfully prevented the terrorists from damaging air force assets. Civilians on the base were also kept safe. But there was a price. Brave Indian defence personnel made the ultimate sacrifice in the line of duty. This is as much their story. The tense narrative follows India’s Garud and NSG Commandos in their mission to stop the suicide attackers. The story is pieced together, with new findings and first-hand accounts of the men, who fought to protect the airbase. Ajit Doval - National Security Advisor to the Govt of India, Air Marshal S.B Deo - Vice Chief of Air Staff, Manohar Parrikar – Former Defence Minister, IAF Group Captain V. Badoni, Squadron Leader - Garud Commando Force, IAF Squadron Leader - Yashu Bhardwaj and Nitin Gokhale - Defence Analyst and Author, tell the compelling story in their own words, with rare insights. Details of the operation - of what transpired behind the scenes, the trials, setbacks and triumphs - emerge, as never before. This is the definitive account of an Indian military op that is a major event in the history of India’s fight against cross border terrorism.